Yeah, I went the route of a horribly bad pun for the post title. I was really unsure what to do with the cards in my scan folder, and for some reason a form of what eventually graces the top of the post in bold font is what came to mind. I'm not really proud of it. Given the chance, I would stop typing and go back to try again. But I have put this many words into the keyboard so no reason to stop now. Reason #774: You think it's funny Jeff, but it never is. Anyway, let me bop a few images from the scan folder from recent mailing here at the home office. I've been slow for the past few weeks and it's all catching up on me. Unless you have been under a rock, simple deduction states that this post is a combination of mailings from Mark Hoyle and P-Town Tom. Mark dropped a small mailer on me, but loaded with goodness. Buehrle throwbacks are always appreciated. Folks love the 80's pajamas we wear on Sundays, but I much prefer this Sunday look from the mid 00's of the Sox 1917 World Series uniforms. Mark also included most of this year's ChiSox team set from Heritage, and that sweet Konerko playing card. Many have posted about getting playing cards from Mark, so he must have found a great deal on a few decks. Thanks pal! If there is something you can count on from Tom at Waiting itil Next Year, it's his disappointment when the Cubs blow it again like they have for the past 108 years. Every team has a bad century, right? Seriously, the thing you can count on with Tom is quality. All his mailings knock of space after space on my binder pages. New miscuts. New bunting cards. And that Flashback card from last year's Opening Day, an insert set I am still trying to complete. How's about some shiny White Sox. That Fisk comes from the Panini 75th HOF Anniversary set that was WAY TOO EXPENSIVE, though a pretty sweet hit release. So I'll take any of the throw in cards from that box. And I think Tom ripped a couple boxes of the Stars and Stripes, considering the Bippin' I got from Rodon and other Sox players in the set. Oddballs made there way. And just what in the hell is that Thomas card? That is one seriously messed up oddball. But with a name on the card like Frankenthomas, I will have to replace whatever card is in the White Sox frankenset binder with that card. Just a given. Nice TTM (or maybe IP) autos of Black Jack and Infante. Infante never panned out on the South Side. He is currently in AAA ball within the Phillies organization. On that scratch off, Luis is wearing a blue hat from the couple year uniform the Sox did in the late 60's. That would make for a great one off game wear. Especially on the road with the blue sanitaries and the white stirrups. I saved this Seaver Topps 3D card for last, as there is a story to it. A few years ago, in one of the first trades I made with Night Owl, Greg sent a copy of this card to me. 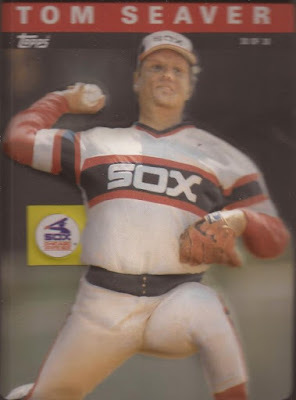 I emailed NO and mentioned I would forward it on to another collector, as while it is a White Sox, I think the Seaver-ness of it made it fit better in another person's collection (Jeff at My Sports Obsession). Fast forward to about 2 months ago, when I finally shipped the 3D Seaver to Jeff, only to have a replacement show back in office about 3 weeks later. Thanks though, Tom. But don't do that again, It's like that damn cat from Zoom. Beauty of a miscut on that Rick Monday. Glad the cards filled some gaps. I was hoping the FrankenThomas would find a home in a FrankenSet! I saw the Seaver card and thought to myself, I just got that card.